I generally hate the term "feel all the feelings" or worse, "feel all the feels," but in this case I couldn't think of a better way to put it. 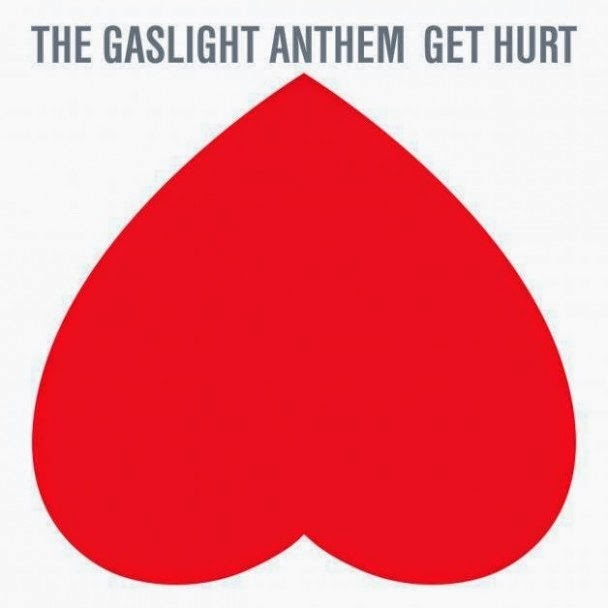 My beloved Gaslight Anthem put out a new record this week, and even though I doubted it (such a bad fan), as it turns out, it just might be one of my very favorites. When I first saw the teaser video for the album I was really turned off. The song sounded like a worse version of Chad Kroeger (if that's even possible) and I had to listen to it a few times to let it sink in that this could possibly be the new direction I'd been reading about. But then I heard Rolling and Tumbling and loved it, and then listened to Get Hurt and loved it even more. THEN I read this article (thank you Emily for sending it my way) and it all started to make sense. When I finally got a chance to listen to the entire album I was blown away. I'm typically a pretty intense person when I love something, so when I say I think this album is amazing I really mean it, but I also don't think this album will be for everyone...even people who really love the band. My favorite part about Get Hurt is just how much emotion and feeling is in it- it's the kind of album I want to listen to when I'm sad, so I can really, really feel sad. Do you do that too? ...or am I the only weirdo here? haha. I'm also a lyrics person, and between the Tom Waits-esque Have Mercy and the Dashboard-esque Halloween (no one else has agreed with me on this one), I'm in heaven. All of the songs are just so great, and yes, even Stay Vicious has won me over after a few listens. I'm so curious to hear what you think too- are you loving this album? What songs are your favorite? So far my top five are Underneath the Ground, 1,000 Years, Dark Places, Halloween, and Have Mercy. Let me know what you think! This is perfect! I absolutely agree. Dark Places is my favorite, and has been repeating while my son plays with his dinosaurs. I love it! The whole album has such a nice flow, an emotional ebb, through the songs. I can't pick out favorites yet- I need a few more listens. PS I was hoping you would post about this- I remember when Handwritten came out and you shared your thoughts. None of my friends listen to Gaslight, so this will have to do. Thanks. I was just thinking I needed some new music! I really love Gaslight Anthem's older stuff so will definitely be checking this out. I just read that interview - what a guy. man, i had insomnia the other night and the chorus of 'get hurt' kept playing over and over in my head. i really did want to get hurt after 4+ hours of the same few words repeating over and over. I wasn't into it at first either but I now I love the entire album! I will hold onto Sink or Swim as my favorite forever though. I was on the edge of my seat waiting for this to drop! I wanted so badly to love it, but also had my doubts. So glad to report that I Love it and get it and oh my god I needed this right now. This album is definitely different, and when I first read that they were taking it in a different directions I was a little devastated. But when they released "Get Hurt" I knew that they could do no wrong, for me anyway. I constantly hear that they are compared to "Springsteen", and I get why people would make that comparison, but this album definitely shows the fan base that they are their own band. They have their own sound, and I'm honestly thrilled that they took this album in a different direction. :) I haven't been able to stop listening to it since it came out. Though I do agree that this probably won't be for everyone (long time fan or not) I'm pretty much in love with it! "Get Hurt", "Dark Places", & "Break Your Heart" are three of my favorites from this album. I loved the album. I don't know how they do it, but they never disappoint me. Sure, their music has changed since Sink or Swim but it's supposed to happen. I think right now my favorites are Helter Skeleton and Dark Places. Oh man! Now you're going to make me give it another go. My best friend is obsessed with Gaslight Anthem and can't understand what I'm not feeling it. I'm totally loving it. Current favorite is Helter Skeleton. But it changes every couple of days.